The previous Type 59 MBT was the first tank entirely built in China, after a copy of the T-54A and with Soviet assistance, both in the design of the factory and supply chain, parts and production engineering. However, relationships with USSR deteriorated at a steady pace. Publicly, these were cordial between Mao Zhedong and Nikita Khrushchev in 1960, but ideologically, a gap intensified rapidly about both countries vision of the leadership of world communism. The Great Leap Forward left USSR baffled, while the latter strictly refused of any help with the development of nuclear weapons, openly supported insurgents in the 1959 Tibetan uprising, or even later sided with India in 1962 in the Indo-Chinese conflict, all of which contributed to built further defiance between both countries. By 1960, after a heated argument in Romania, Khrushchev withdrew all engineers and consultants in China, and put an end to all cooperation projects. In 1962, the Cuban crisis’ end led Mao to officially treat USSR’s premier as a “capitulationist”. In 1964 the divide was consummated as Mao considered a “counter-revolution” had re-established capitalism in USSR. Diplomatic relations were broken, the whole Warsaw pact siding with USSR while China strived tobuildt its own communist sphere of influence in SE-SO Asia that was to play fully in the Vietnam war. The final blow was delivered in march 1969 with a border conflict at the Ussuri River and on Damansky and Zhenbao Island, and several other clashes. In 1971, there were series of secret discussions, following an official state visit of Richard Nixon to China in 1972. This compromised any return of formal relations with USSR and saw a warming with the West, allowing some of Western technologies to be reused in Chinese tank design. The “second cold war” was born. 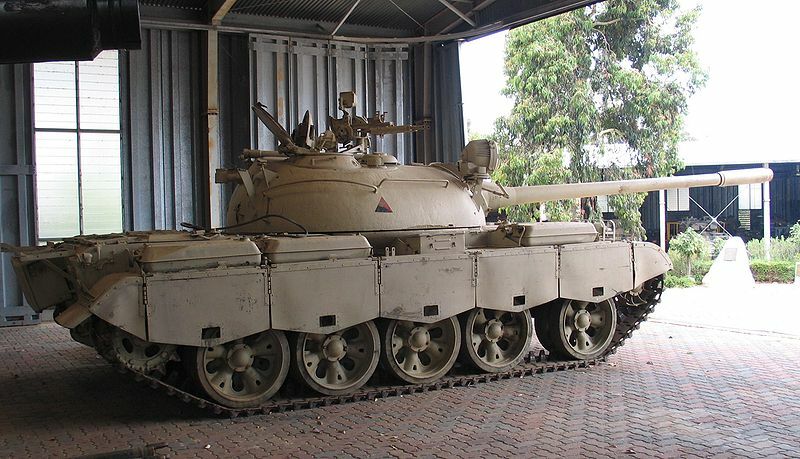 Side view of an Iraqi captured Type 69-II (in running order) on display at Puckapunyal, Australia. 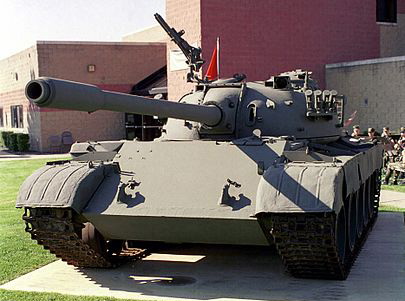 The war in Iraq helped Western intelligence to take the pulse of Chinese tank design in 1990. These political events meant that Chinese tank designs, once largely modeled after Soviet models were now left to be upgraded with Western components of various types, ranging from the engine to the torsion bars, FCS, laser RF, optics, and main gun. These series of modernization were intended for a possible conflict with USSR and the greatest interest was the level of advancement of Soviet designs in the late 1960s, that led to create the Type 69. The latter was still largely a Type-59, but China’s 617 Factory started working on a possible replacement for the Type 59 right after 1963. However by 1969, a soviet T-62 was captured, and comprehensively reverse-engineered by the Chinese. Among other things, the Soviet Luna IR searchlight system was passed onto the Type-69 design, along with other components. The type 69 in its final version entered in service and was publicly revealed in 1982 but however failed to meet the Chinese PLA’s requirements, ended up as an export model, and eventually produced to an estimated of 2200 to 2500 vehicles of which around 2000 were exported. By the mid to late 1980s, Type-69s were upgraded with Western engines, main gun and FCS, giving birth to the Type 79. However all three types, the Type 59, 69 and 79 were still 1st generation tanks. Real improvement came with the Type 80/88. Externally, the latter is quite difficult at first to distinguish from the Type 59. This is basically a close evolution of the Type 59, with a 580 hp diesel engine, Type 69 100 mm smoothbore gun (still similar in appearance with the former with its characteristic muzzle fume extractor), an IR searchlight, and a 1st generation laser rangefinder. Therefore first hit capabilities is improved, although with its basic stabilization system there is limited accuracy when firing on the move. NBC protection is individual. This model was only produced as a prototype, as after capturing a T-62 new prospects for upgrades were drawn off. This model is upgraded with copied T-62 components, the Luna IR searchlight system and an improved NBC collective protection lining. However, this model was considered experimental and only led to a test production. It was armed with a 100 mm smoothbore distinct and slightly longer than the 100 mm rifled gun of the Type 59 MBT, with a bore evacuator nearer the end of the muzzle. Ammo range comprised AP, HE, HEAT and high-velocity armour-piercing discarding sabot (HVAPDS). It had also an external (over the main gun mantlet) laser rangefinder, similar to the one observed on the Type 59 MBT. Other features includes the possibility ot lay a smoke screen by injecting diesel fuel into the left side exhaust and the hull and turret are also coated with infrared reflecting paint. The main production version, which received an impressive array of modifications. These includes: The Type 69-II 100 mm rifled main gun (much more precise than the smoothbore), a new FCS system counting a TSFC dual axis gun stabilization system, a Type 70 gunner sight, a TCRLA Laser rangefinder and a BCLA Ballistic computer. The laser RF measures the distance to the target and transmit data to the ballistic computer which in turned controlled the automatic range-setting mechanism of the sight and simultaneously laying the gun, setting the correct elevation. The external laser RF was externally mounted and therefore was vulnerable. It was later replaced by the optional TSFCS-L combining the LRF with the gun sight in a single unit located inside the turret. The retrofitted TSFCS-C combined a gunner’s sight, laser rangefinder, ballistic computer and the console displaying data from the sensors providing elevation, azimuth, crosswind, air temperature, and ammunition charge temperature. The computer also interfaces with the dual stabilization system. The driver, located on the left hand side (seen from the turret) had its hatch covered by three day periscopes covering the frontal arc, the central one replaced by a night periscope with a range of 60 m and 30° field of view. The commander was given an standard turning table type cupola with six vision block and a Model 69 infrared sight which had a magnification of x5/12° field of view (day) or x6/8° field of view by night. The gunner’s model 70 infrared sight has a magnification of x7/6° field of view with an effective range of 800 m. This tank is also equipped with a Type 889 radio and a Model 803 intercom. Some Type 69 MBTs have been observed fitted with an external stowage bin on the turret rear and armour protection for the anti-aircraft machine gun. The Type 69-II has a combat weight of 36.7 tonnes and a power-to-weight ratio of 15.8 hp/tonne for a ground pressure of 0.82-0.83 kg/cm2. 44 rounds of 100 mm are carried, along with 500 rounds for the roof mounted 12.7 mm and 3,000 rounds for both 7.62 mm LMGs. Ammunitions were of the HEAT, HE, APHE and APFSDS, of which at least three models were developed, including one allegedly using depleted uranium caps. 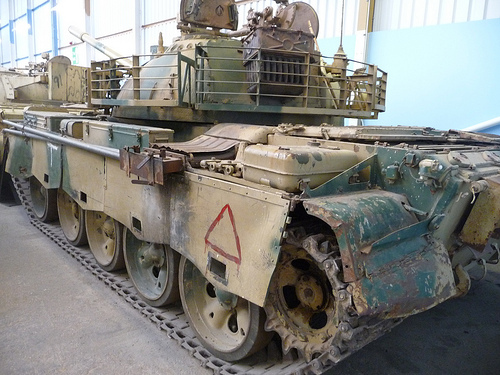 All tanks were also fitted with rubber track skirts, double pin track links, and could be recognizable for their storage racks running all along the turret, which doubled as BAR armour against RPGs. Two banks of 3 smoke grenade launchers are also added on the turret’s sides, and twin diamond-shaped oil caps could be seen on the angled plate behind engine deck which also help to identify the main production version of the Type 69. Other modifications includes an hydraulic booster for the steering mechanism and main clutch, an automatic fire detector/extinguisher and engine low-pressure alarm. Some were seen showing an external stowage bin on the turret rear and a cradle-type full armour protection for the heavy AA Type 54 HMG. The type 69-II was mostly exported produced under license in Pakistan by the Heavy Industries Taxila among others. A specific command version with additional communication and more powerful radio sets, a Type 889 radio and a Type 892 radio for the B and two Type 889 radios for the C. These are coupled with the necessary auxiliary power unit. Externally the command version (one organic per battalion) is recognizable to its long radio aerial and the two storage boxes fitted on the rear deck, storing cables and the field phone set. The Armoured Recovery version. Turret less, fitted with an armoured superstructure, a dozer blade at the front and an hydraulically powered crane with a lifting capacity of 70 tons. Still in service in the PLA. Also called at the beginning Type 69-III or factory WZ-121D (1st prototype in 1981), this was an all-upgraded version with Western technologies. Two enhanced prototypes were built in 1983 with most of the following upgrades and a new laser rangefinder. Production started in 1984, and the Type 79 was publicly revealed at the PRC’s 35th anniversary parade. Most were for PLA’s service alone, although Sudan MIC and PRC industries built some 100 Type 79s in the late 1980s. Externally, the most easiest way to recognize a Type 79 is the Type 83 (L-7 derived and improved 105 mm rifled gun), which was compatible with mostly NATO ammunition including APFSDS. It could be equipped in addition with the Type 79II thermal sleeve. The rest of the armament was unchanged, with a bow-mounted 7.62 mm LMG Type 59T, another coaxial, and the roof-mounted 12.7 mm heavy HMG Type 54 derived from the Soviet DsHk. Along with the new gun, there was a whole array of sights, FCS and RF upgrades, upgraded in Western standards. This included passive IR sights/thermal imaging systems for the Commander, a British Marconi Fire Control System composed of a TLRLA laser rangefinder, BCLA ballistic computer, and a TGSA gunner sight. The turret was fitted with an improved NBC collective system, for the first time with an agent automatic detector that shuts and sealed the hatches. The list of modifications includes an improved Type 79 liquid-cooled 730 hp diesel engine, and the introduction of rubber-padded tracks for smoother rides, less wear for the links and less stress on the suspensions and road wheels. Field performances are as follows: Vertical obstacle: 0.8 m, Trench: 2.7 m, Fording: 1.4 m, Gradient: 60%, Side slope: 40%. Ground clearance was 425 mm, with a width gap between tracks of 2.64 m and 3.845 m of contact length on the ground. For the first time, provisions are made on the turret and glacis front for explosive reactive armour (ERA) bricks. Rubber side skirts are standard top protect the drive train against RPGs, and the turret is surrounded by a storage bay which doubled as slat/BAR armour. Banks of three smoke dischargers are also fitted as a standard in the front of the turret. The Chinese P.L.A. Type 69/79 never saw action, but perhaps in the Tian an Men student revolt and events of 1989. 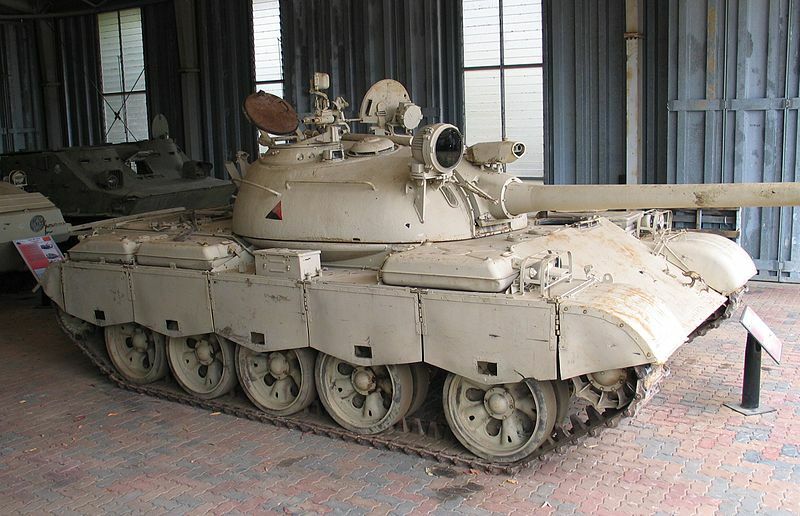 During the Iran-Iraq war, the Iraqi army had perhaps 900+ Type 69 tanks in service then, recently received, that saw action against around 200 Iranian Type 69s sold in the meantime. To distinguish themselves, the Iranian tanks were apparently decked with flags. 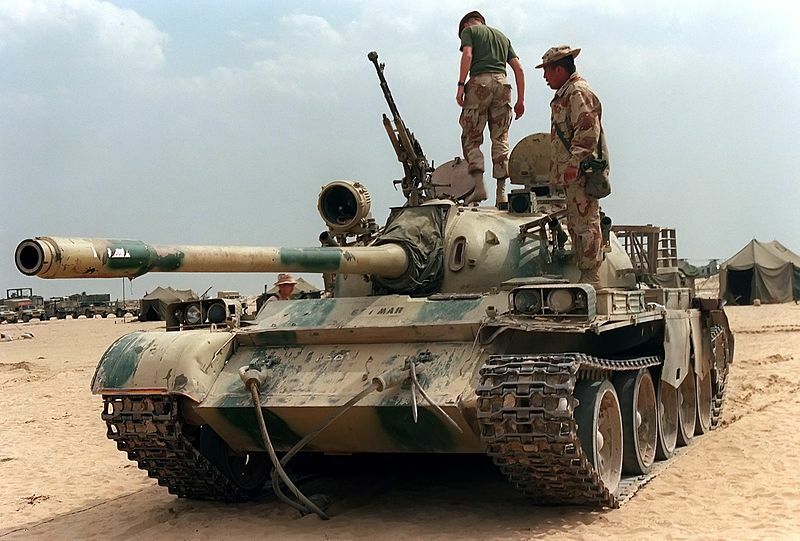 Other batches of Type 69s were acquired from China and were modified following the experience of this war, still in service by the time of the 1st gulf war in 1991. By 2003, many were still in service, easily destroyed by American M1A2 Abrams. In the aftermath of the American and coalition occupation and reorganization of the Iraqi forces, all were scrapped. Myanmar Type-59-IIs were seen in action in 2001 during the battle for Border Post 9631 against Royal Thai Army M60A3s (which also possessed Type-69s). The Type 69 were exported to 9 countries from 1982, about 2000 in total, and license-built locally into Pakistan. 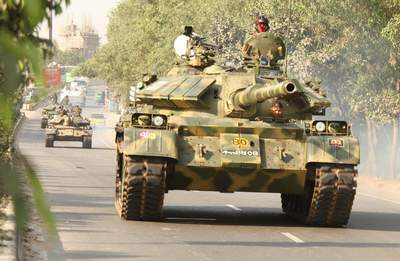 They were modified locally in Iraq (which took the bulk of these cheap tanks with around 1500 declined into several variants), Bangladesh, and more recently Myanmar (Burma). In Chinese service around 300 of both types were in service in the 1990s, nowadays, 200+ are kept for training and reserve units. They are registered by NORINCO as the WZ-121. They are likely to be scrap for their metal value, now fully replaced and still essentially 1st generation MBTs. However a few are in service for much longer, demilitarized and converted as Chinese firefighting tank in three fire brigades. 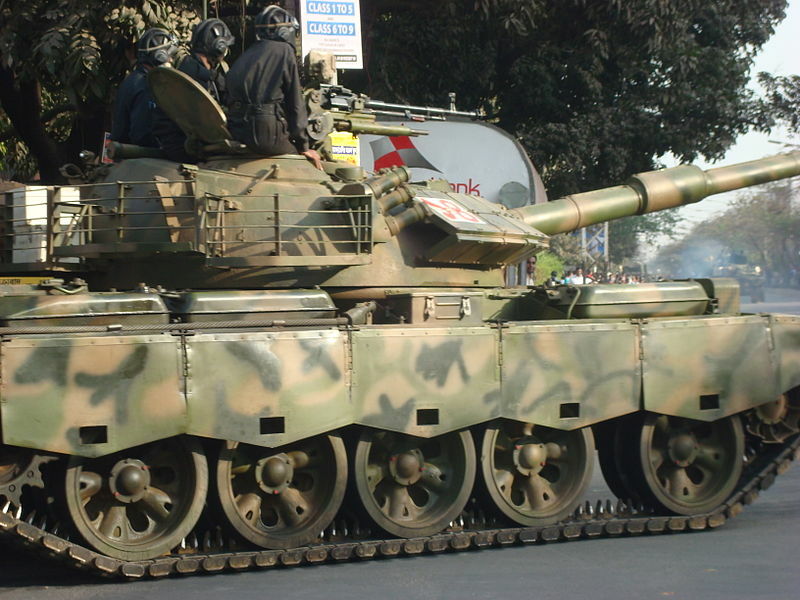 The Bangladeshi army purchased 185 Type-69-II Mk.2G and 65 Type-69-II tanks. The Type Mark.2G was a locally upgraded version which comprised a bi-axis stabilized 120 mm smoothbore main gun (NATO compatible and ATGMs capable) fitted with a semi-automatic loader, a new FCS, new laser range-finder, new thermal imaging sights, a data-link and probably new ballistic computer as well as a laser alert captor. The power plant was also completely overhauled to a 1,200 hp diesel engine for much increased performances, whereas the protection was upgraded to ERA (glacis and trret front). There was also an automatic fire suppression system inside the crew and engine compartment, a new collective NBC suite, improved communications and navigation systems including GPS navigation. These tanks are now front line. Iraq had some 1500 Type Type 59/69 in service at the start of Operation Desert Storm, of which most had been upgraded in 1984-91. 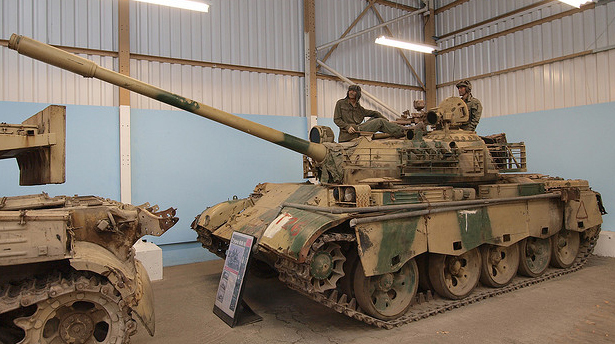 The Type 69-QM (1986) (locally called T-55B) kept the 100 mm rifled main gun, but had an extra appliqué armour on the front glacis, observation mast and, and apparently a 60 mm mortar for some. Some command tanks were upgraded in the same line as the Enigma T-55s. The QM1 (1984) received the NATO 105 mm rifled gun and a laser range-finder. The QM2 (1986) received a Warsaw Pact standard 125 mm (L80) smoothbore main gun and laser range-finder. One of the biggest operators, Pakistan had once 400 Type 69-II in service but a source (army-guide.com) suggested 2500 were in service in total. The level of upgrade in unknown but they are apparently fitted with ERA on the glacis and turret front. Now replaced by the MBT-2000, Al Zarrar and Al Khalid. 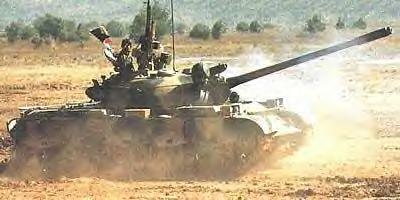 Iran had 200 tanks in service during the Iran-Iraq war. Their fate is unknown. Burma had 260 tanks (Type 59s included), and were upgraded as the Type-69 (MBT 50) and Type-69-II (MBT 80) from 2007 on. The Thai Royal Army had 50(95?) tanks in service (using US-built 12.7 mm Browning M2HB instead of the Chinese Type 54 AA machine gun), Sri Lanka 20, Zimbabwe 10, and Sudan manufactured locally by MIC and PRC around 200 tanks of the Type 69-II and Type 79 types. According to the Russian Wikipedia, 150 were also in service with Albania (unverified). The Type 69/79 on wikipedia. Armament Main: 100 mm Type 58 rifled. Armour : Sloped glacis, turret front 180 mm RHA. Total production Around 3200 (high estimation). Type 69 MBT prototype of the P.L.A. 1974. Type 69-II prototype. Notice the unusual camouflage. Type 69-III prototype, painted in full green livery. 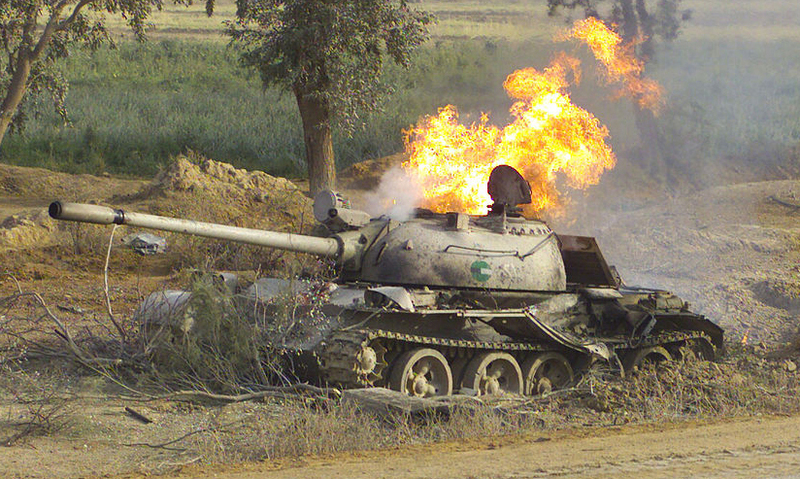 Iraqi Type 69 QM in service with the Iraqi new army in 2007. Iraqi Type 69 QM2 in 2003. The type 79 it’ s not an export version only 800 tanks were built wich were destinated to PLA only. In the list Pakistani type 79 its a wrong information , Pakistan have only type 69’s in different stage of modernizations.